Hosting & Application delivery, Database processing & Storage, Simulation, Automation, etc. 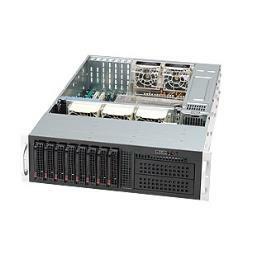 Supermicro X9DRH-7TF, eATX 12" x 13" (30.5cm x 33cm). - Support SAS RAID 0, 1, 5, 6, 10, 50, & 60. - Support two SATA3 6.0Gbps ports, and eight SATA2 3.0Gbps ports. - Support SATA RAID 0, 1, 5 & 10. Support 10BASE-T, 100BASE-TX, 1000BASE-T, & 10GBase-T with RJ-45 outputs. Serial Attached SCSI: 8x SAS2 6Gbps ports. Serial ATA: 2x SATA3 6Gbps ports, 8x SATA2 3Gbps ports. LAN: 2x SFP+ ports for 10GbE LAN, 1x RJ-45 port for IPMI dedicated LAN. Serial Port: 1x Fast UART 16550 serial port, 1x serial header. LEDs: Power, Hard drive, Networking, UID, fan fail/System Overheat, & Power fail LEDS. 8x 3.5" drive bays with HDD hot-swap tray, enterprise SAS or SATA HDD recommended.